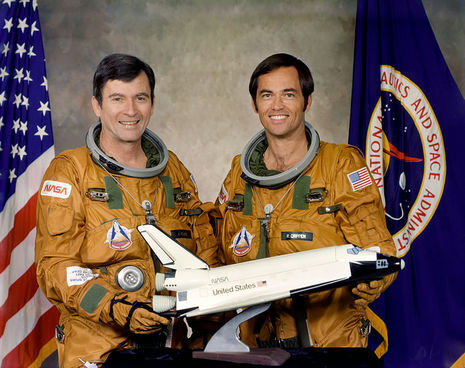 The first launch of the Space Shuttle occurred on 12 April 1981, exactly 20 years after the first manned space flight, when the orbiter Columbia, with two crew members, astronauts John W. Young, commander, and Robert L. Crippen, pilot, lifted off from Pad A, Launch Complex 39, at the Kennedy Space Center. This was the first of 24 launches from Pad A. The launch took place at precisely 7 a.m. EST. A launch attempt two days earlier was scrubbed because of a timing problem in one of Columbia’s general-purpose computers. 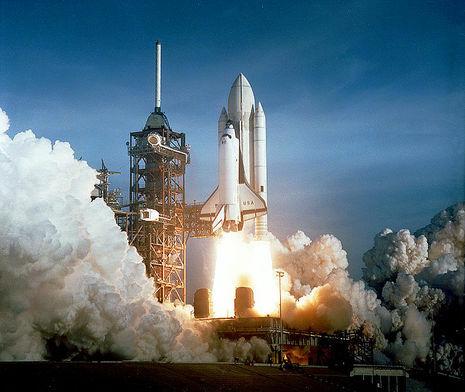 Not only was this the first launch of the Space Shuttle, but it marked the first time that solid-fuel rockets were used for a NASA manned launch (although all of the Mercury and Apollo astronauts had relied on a solid-fuel motor in their escape towers). STS-1 was also the first U.S. manned space vehicle launched without an unmanned powered test flight. The STS-1 orbiter, Columbia, also holds the record for the amount of time spent in the Orbiter Processing Facility (OPF) before launch – 610 days, the time needed for the replacement of many of its heat shield tiles. 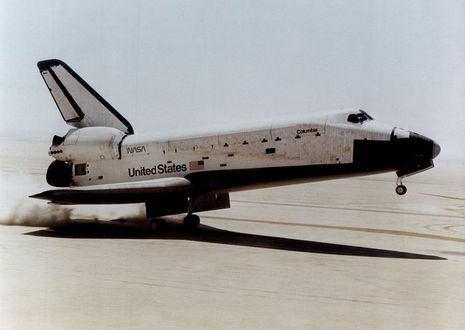 The primary mission objectives of the maiden flight were to perform a general check out of the Space Shuttle system, accomplish a safe ascent into orbit and to return to Earth for a safe landing. The only payload carried on the mission was a Development Flight Instrumentation (DFI) package, which contained sensors and measuring devices to record the orbiter's performance and the stresses that occurred during launch, ascent, orbital flight, descent and landing. All of these objectives were met successfully, and the orbiter's spaceworthiness was verified. 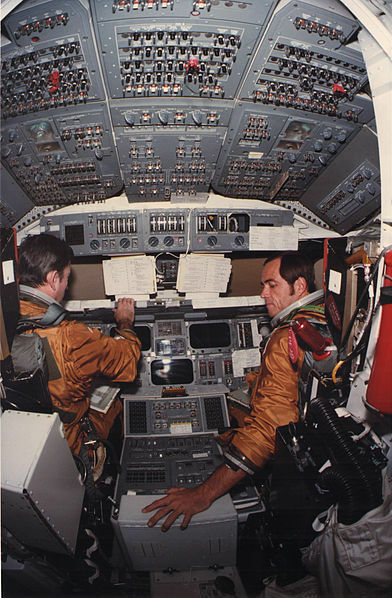 During flight day 2, the astronauts received a phone call from Vice President George H. W. Bush. President Ronald Reagan had originally intended to visit the Mission Control Center during the mission, but at the time was still recovering from an assassination attempt which had taken place two weeks before the launch. Columbia reached an orbital altitude of 166 nautical miles (307 km). The 37-orbit, 1,074,567-mile (1,729,348 km)-long flight lasted 2 days, 6 hours, 20 minutes and 53 seconds. 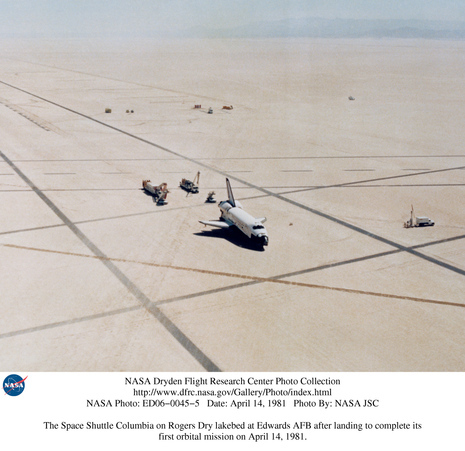 Landing occurred on Runway 23 at Edwards Air Force Base, California, at 10:21 am PST, 14 April 1981. Columbia was returned to Kennedy Space Center from California on 28 April atop the Shuttle Carrier Aircraft.